An automated restaurant created by ironmonger Michael Mack has achieved what testy diners have dreamed of for millennia - a restaurant without waiters. 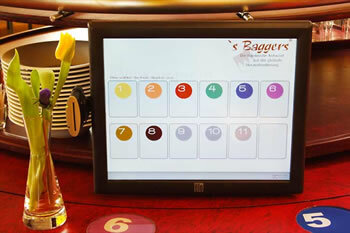 Tasty dishes are ordered via touchscreen, and then dropped directly onto patron's tables. The automated restaurant's kitchen is located just under the roof of the building. Customer orders are placed via touchscreen, and then logged into the computer system that controls every aspect of food delivery. Customers are kept constantly in the loop with estimates on their food ETA. 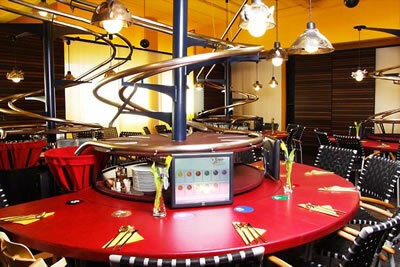 Finally, specially-made hotpots slide down fifteen foot steel spirals, delivering the goods to happy diners. Purists should note that this is not a fully-automated restaurant because it does have human cooks. (Take a look at AIC-CI Cookingrobot Chinese Robotic Chef for a real robot chef.) Also, there are other examples of restaurants that offer automated ordering systems (see the Bytes Restaurant With Touchscreen Ordering for details). However, we do seem to be getting closer to a fully automated restaurant. Kantos Kan led me to one of these gorgeous eating places where we were served entirely by mechanical apparatus.